Take a picture with Sonic the Hedgehog and enjoy a delicious buffet on Easter Sunday, April 21st from 10am – 3pm. Great food, entertainment for all ages; GameTime is perfect for the whole family! Celebrate Cinco de Mayo at GameTime! Join us for a fun & festive Cinco de Mayo at GameTime where we’ll be serving up delicious Carnitas Tacos (2), Churros with Nutella, signature Margaritas and Tequila shots all weekend 5/2 – 5/5 for only $5 each! Get a Bucket of 5 Coronas for only $15! BOGO Alert – GameTime’s biggest promotion of the week just got BIGGER! 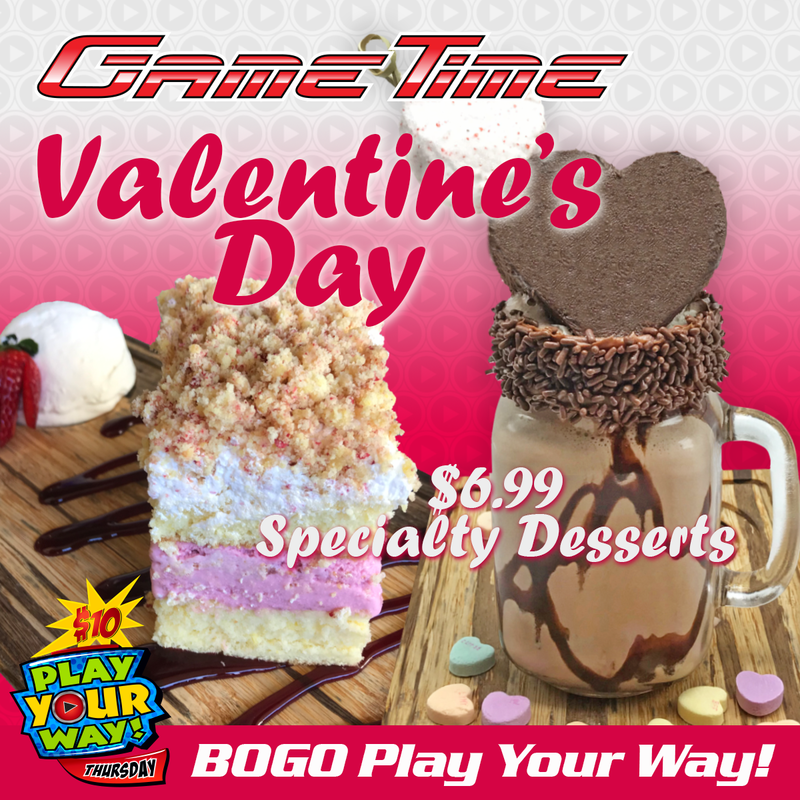 Invite your Valentine out for some fun, games and delicious specialty desserts on February 14th and “Play Your Way” for FREE with purchase of one “Play Your Way” offer! This deal gives you and your loved one up to 5 hours of Timed Play from 7pm-12am for only $10!